Peel and finely chop onions, place in serving bowl. 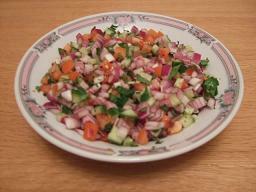 Finely dice tomato and cucumber and add to serving bowl. Finely chop coriander and place in serving bowl. Add the lime juice and freshly ground black pepper and mix well. Serve with poppadoms and raitha and chutnies. Cut Avocados in half, de-stone and remove outer skin. Lay halved avocados on the chopping board, flat side down. Cut long slices, leaving each slice attached at one end. Place on serving plate and fan out slices as in the picture. 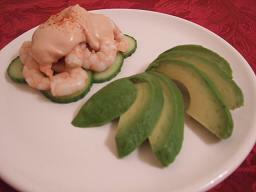 Place slices of cucumber on plate and put 100g / 3.5oz prawns on top. Put mayonnaise, ketchup, and Worcester sauce in a bowl and mix well. Spoon the mixture over the prawns. Sprinkle a little paprika over the sauce and serve. Place gelatine sheet in the small Pyrex bowl and cover with cold water. Leave for 5 minutes and then remove gelatine and squeeze it to remove excess fluid. Empty the bowl and pat dry. Put gelatine back in bowl and add the white wine. Stand the bowl over a saucepan of very hot water until the gelatine has dissolved. Finely dice the smoked salmon. Flake the cooked salmon with a fork, removing any skin or bones that you come across. Add everything except the egg whites to the wine and mix together. Leave in the fridge until it starts to stiffen. Whisk the egg whites until you can make stiff peaks. Gently fold into the fish mixture. Lightly oil or butter the ramekins. When set, turn the mousses out onto individual plates. 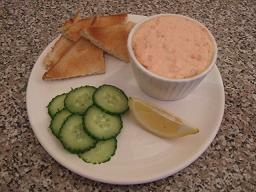 Serve with lemon and cucumber and toast or bread of your choice. Peel and crush garlic using the garlic crusher. Finely grate the parmesan, add to the garlic, saving half for the topping. Add the butter, herbs, and black pepper. Mix ingredients together to make a smooth paste. Cut French stick at an angle to make long slices around 2.5cm / 1" thick. 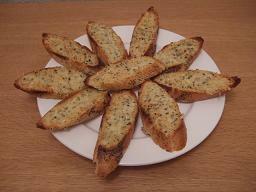 Spread garlic butter over one side of each slice of bread and top with remaining cheese. Place under a medium grill until lightly browned. Heat the oil ready for frying. Deseed chilli and chop finely. In the mixing bowl, mix the flour, egg, chilli, black pepper and iced water together. This batter should not be smooth. Dip the seafood in to the batter then drop straight into the hot oil. Do this in batches to avoid everything clumping together. 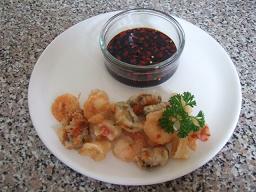 Serve with sweet chilli dipping sauce or soy sauce with chopped chillies. Try using vegetables instead of seafood for a healthier, cheaper alternative. Add coriander and black pepper to fish mixture and mix well with your hands. Shape mixture into 8 balls and flatten to 2.5cm / 1" with a fish slice. Coat each cake with beaten egg then cover well with breadcrumbs. 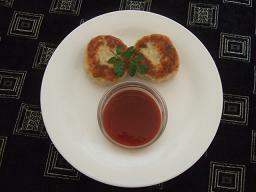 Serve with sweet chilli dipping sauce or a light salad. 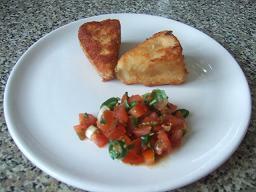 Chop tomatoes into very small pieces. Peel and slice spring onions very finely. Mix all these ingredients together with the olive oil and some black pepper and spoon onto serving plates. Roll each wedge in the flour until well covered. Cover each wedge with beaten egg. Coat each wedge with breadcrumbs. Repeat the previous two steps for each wedge. When hot enough, fry the wedges in the oil, until golden brown. Peel and crush garlic with mortar and pestle until fairly smooth. Turn Mushrooms upside down and coat the gills with the butter mix. Place in the roasting dish in the centre of the oven for 20 minutes, basting occasionally. 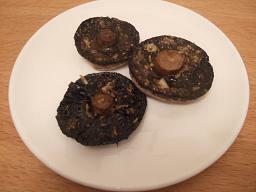 After serving drizzle juice from roasting dish over the mushrooms and garnish with a bit more black pepper. Start heating the oil on medium/high heat in the saucepan or fryer. Break the eggs into the large mixing bowl. Separate the rings into the eggs. Add rest of the ingredients and mix thorougly until the onions are coated. Test the heated oil by putting a little bit of onion in it. If it floats to the top straightaway the oil is ready to cook in. Using both hands make little balls with the onion mixture. After making each ball gently drop each one into the hot oil. 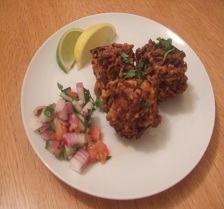 Occasionally turn the bhajis so they cook evenly. When golden brown all over, drain on kitchen paper and serve with salad and garnishes.